LOCATION.--Lat 40°31'34", long 75°03'54" referenced to North American Datum of 1983, Frenchtown Borough, Hunterdon County, NJ, Hydrologic Unit 02040105, on upstream side of Uhlerstown-Frenchtown bridge, about 200 ft west of left back in Frenchtown, 900 ft upstream of mouth of Nishisakawick Creek, 0.5 mi southeast of Jugtown, PA, and 3.0 miles west of Baptistown. PERIOD OF RECORD.--Annual maximum gage, water years 1936-1956, 2005-2006, Continuous-record gage-height station, water years 2008 to current year. GAGE.--Water-stage recorder with telemetry. Datum of gage is 99.88 ft above NGVD of 1929. EXTREMES FOR PERIOD OF RECORD.--Maximum gage height, 27.79 ft, Aug 20, 1955. EXTREMES OUTSIDE PERIOD OF RECORD.--The flood of Oct 10, 1903 reached a gage height of 24.4 ft.
Water years 1976 to 1982. Dissolved Oxygen: September 2014 to current year. Dissolved Oxygen, Percent of Saturation: September 2014 to current year. pH: September 2014 to current year. Specific Conductance: September 2014 to current year. Water Temperature: September 2014 to current year. Turbidity: September 2014 to current year. REMARKS.--The accuracy of continuous water-quality data can be obtained by using this link. DISSOLVED OXYGEN, PERCENT OF SATURATION: Maximum, 173%, July 25, 2015; minimum, 64%, May 5, 2015.
pH: Maximum, 9.4 standard units, Jul 24, 25, 26, 2015; minimum, 7.1 standard units, Jul 3, 4, 5, 2015. SPECIFIC CONDUCTANCE: Maximum, 464 microsiemens/cm, Feb 02, 2015; minimum, 121 microsiemens/cm, Jul 2, 2015. WATER TEMPERATURE: Maximum, 29.4°C, Jul 18, 2015; minimum, 0.5°C, Jan 28 and 31, 2015. TURBIDITY: Maximum, 190 FNU, Jan 18, 2015; minimum, 0.0 FNU on many days. 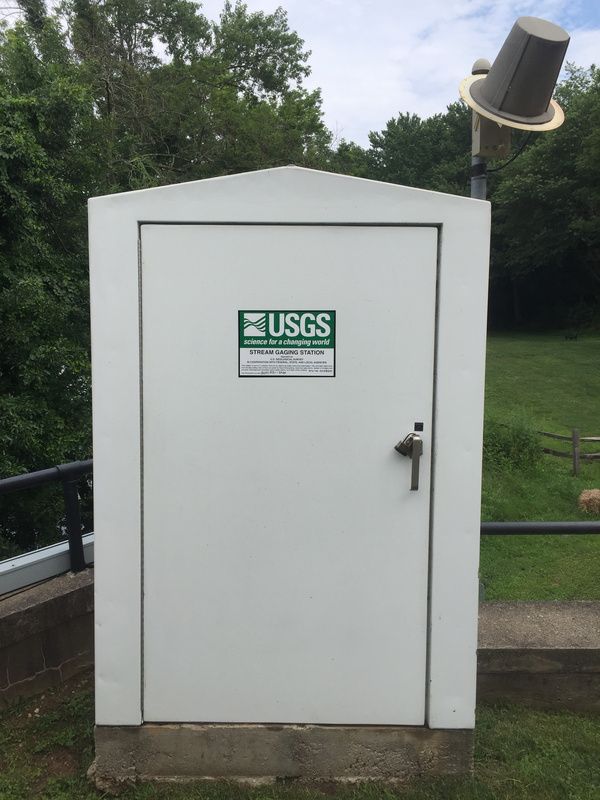 National Weather Service flood stage for this gage is 16.0 ft.